BTC has hit a 10-month high in transaction volume. Meanwhile, tx fees are at a multi-year low. These figures indicate that factors such as scaling improvements to the Bitcoin protocol, and the relatively modest price of bitcoin, have made transactions in the cryptocurrency extremely affordable. At 300,000 transactions per day, Bitcoin is reaching new highs with users across the globe taking to the platform. Using LocalBitcoins data as a proxy, growth in transactions by weekly fiat to bitcoin trades have exploded in South America, Eastern Europe, and Africa—especially in places with unstable or unreliable currencies. From CryptoSlate’s own experience, payments in bitcoin have opened up a new section of the economy. Previously, payments to some places in Africa and Eastern Europe were difficult because of restrictions from PayPal and other payment services. Now, skilled and digitally connected workers from these countries can participate in the global marketplace. 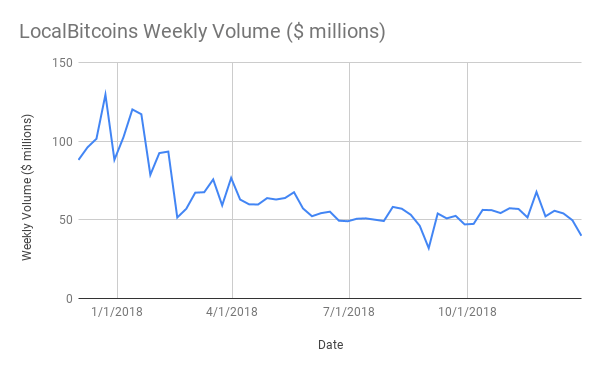 That said, global volume on LocalBitcoins has decreased over 2018. These decreases could be a result of many external factors, such as increased availability of convenient exchanges and cryptocurrency restrictions in places such as China, India, and other ASEAN countries. Meanwhile, transaction fees are at a two year low, both in absolute and fiat terms. Median transaction fees are at a modest $0.031 per transaction. In absolute terms, fees are also at multi-year lows, with a single byte of data costing between 2 and 30 satoshis for transmission over the network. In absolute terms, the cost in bitcoin for use of the network has trended down, even with the increased volume. In 2016 the average cost per byte of data was roughly 55 satoshis. In 2018, the average cost per byte was under 30 satoshis. These decreases are attributable to improvements in the Bitcoin protocol such as SegWit in August of 2017, and the release of off-chain scaling such as the Lightning Network in December of 2017. For comparison, the average cost of a credit card transaction is roughly 2 percent plus a $0.10 transaction fee. Looking at these costs alone, in absolute terms Bitcoin is more than three times cheaper for small transactions, and far more cost-effective for large transactions. Unfortunately, the cost of converting bitcoin to fiat still remains quite costly for many businesses. For reference, Coinbase charges retail customers a 2 to 2.5 percent transactions fee when the spread is included, in addition to a flat fee of $1 to $3. This does not even factor in bitcoin price volatility. On the positive side, these costs should decrease over time as the exchange niche becomes more competitive. Cash can also incur other costs for retail businesses because of high record keeping costs along with higher rates of employee-theft; some businesses are even going cashless to reduce these factors. However, bitcoin may also have a high risk of theft in a brick-and-mortar setting, but this data is not yet available. In aggregate, these metrics point towards the growing acceptance and adoption of Bitcoin, especially in places with unreliable governments or high inflation. Furthermore, the cryptocurrency may also be encouraging international commerce in places with poor payment infrastructures. In all, 2019 looks positive for continued growth in Bitcoin adoption.